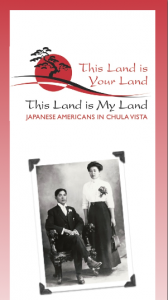 CHULA VISTA — “This Land Is Your Land, This Land Is My Land: Japanese Americans in Chula Vista” is on vie at the Chula Vista Heritage Museum, 360 Third Ave. (east side of Memorial Park), until May 30. Sponsored by the Friends of the Chula Vista Library and developed in partnership with the Japanese American Historical Society of San Diego, the exhibit features words, photographs and artifacts documenting the arrival of Japanese workers in 1905, the “celery wars” of the 1920s, and the community’s internment during World War II. The exhibit features a replica of barracks at the Poston, Ariz., camp, where about 450 Chula Vista residents were interned during the war. The 10-by-15-foot room would have housed up to six people and is furnished with furniture made in the camp between 1942 and 1945. Museum board member Imozelle McVeigh was project manager for the exhibit, working with Linda Canada of the JAHSSD. Local historian Dr. Steven Schoenherr created a map showing the location of Japanese farms in the area from 1905 through 1967. Other project team members were museum intern Amber Tiffany, who assisted with research, and board member Jim McVeigh, who handled logistics. Museum hours are noon to 4 p.m. Tuesday and Thursday, noon to 3 p.m. Saturday. Group tours by appointment. For more information, call (619) 427-8092 or visit www.thefcvl.org. In conjunction with the exhibit, the Friends of the Chula Vista Library will host a free showing of the 1976 made-for-TV movie “Farewell to Manzanar” on Wednesday, May 8, at 6 p.m. at the Civic Center library. Based on the book by Jeanne Wakatsuki Houston and her late husband, James D. Houston, the movie focuses on her experiences as a young girl at the Manzanar internment camp. During an appearance at the Civic Center Library last October, Houston discussed camp life and the difficulties she and other Japanese Americans faced in returning home after the war. In the audience was Chula Vista resident Sumiko Yamauchi, one of the Wakatsuki family’s neighbors at Manzanar. Big band music from the 1940s greeted the 300 guests who arrived for the grand opening of “This Land Is Your Land, This Land is My Land” last June. Downbeat Big Band provided entertainment in Memorial Park as visitors viewed the exhibit. The highlight of the event was the performance of songs from “Allegiance — A New American Musical,” which had its world premiere at The Old Globe in San Diego last September.